The Destructive Storm That Built An Unlikely Political Bridge : It's All Politics President Obama and Republican New Jersey Gov. Chris Christie continued their display of post-hurricane bipartisanship. 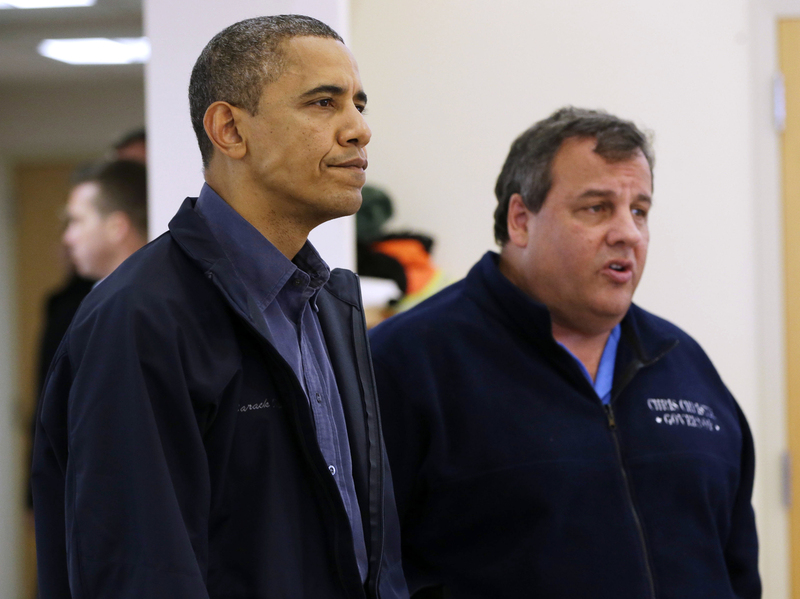 It was striking considering Christie's pointed criticisms of Obama before the disaster. President Obama and New Jersey Gov. Chris Christie at the Brigantine Beach Community Center in Brigantine, N.J., where they met with local residents displaced by Sandy. Though Superstorm Sandy destroyed much in its path, it did apparently build at least one bridge, that of bipartisanship between President Obama and New Jersey's Republican Gov. Chris Christie. Christie, a strong ally of Mitt Romney, the GOP presidential nominee, and a key critic of the president before the storm, has had little but praise for Obama for the assistance provided to New Jersey leading into the epic storm, which hit this week. The bridge between Christie and Obama, first visible in media interviews the governor did earlier this week, was on full display Wednesday as the president visited New Jersey at the governor's invitation to view the the heavily damaged Jersey Shore. The two men viewed the devastation from Marine One, visited a community center in Brigantine, N.J., that's being used as an evacuation center, and talked to first responders and federal, state and local officials. They then praised each other effusively at a news briefing. "He has worked incredibly closely with me since before the storm hit. I think this is our sixth conversation since the weekend. And it's been a great working relationship to make sure that we're doing the jobs that people elected us to do. And I cannot thank the president enough for his personal concern and compassion for our state and for the people of our state. And I heard it on the phone conversations with him, and I was able to witness it today personally." "I want to just let you know that your governor is working overtime to make sure that as soon as possible everybody can get back to normal. Hopefully if your homes aren't too badly damaged we can get the power back on and get you back in. For those of you whose homes are damaged we've also got Director Fugate of FEMA and one of the things we're going to do is to activate and make sure you guys are getting the help you need as quickly as possible." Christie nodded his head often in agreement, and even smiled at the appropriate places during Obama's remarks. It was clear that what politics had brought asunder, the storm had brought together. It was an especially stunning reversal for Christie. It was only August at the Republican National Convention in Tampa, Fla., that he accused the president of offering no more than "absentee leadership in the Oval Office..."
But that could be chalked up to windy political rhetoric. The very real and destructive gusts from a killer storm clearly changed the dynamics for those politicians who will be held most accountable for rescue and recovery efforts. The behavior of the president and governor could, of course, be readily explained as a very human response to the human suffering and staggering physical devastation caused by the storm. But with the storm occurring amid an exceedingly close, and vitriolic, presidential election, it was difficult for some observers not to be cynical about this newest political odd couple. "... The Christie-skeptic theory would be that (a) at a minimum, he's prioritizing his own reelection bid as governor over Romney's campaign and (b) that just maybe he secretly hopes Romney loses because it'd clear the way for his own 2016 candidacy. (Remember that Christie's convention speech was lighter than expected for the nominee.)..." You don't even have to travel as far as 2016. Christie is up for re-election as governor in 2014. One of his challengers is expected to be the irrepressible Democratic mayor of New Jersey, Cory Booker. But Obama's political judgment day, next Tuesday, is even closer at hand. A new poll suggested that in the very tight presidential contest with Romney, his handling of the disaster might, repeat, might give him an edge. The ABC News/Washington Post poll found that 78 percent of those surveyed rated Obama's performance as excellent or good with just 8 percent rating it negatively. Romney's clocked in at 44 percent, though in fairness, it's harder for the challenger to have much of a role in a natural disaster. The polls suggested that Obama and Christie's bipartisanship was being mirrored to a degree by the partisan voters who responded to the survey. That's how you get to nearly 80 percent of voters giving Obama such high ratings. A significant number of Republicans are in that percentage.